Being a customer oriented firm, we are engaged in offering the best quality Pouch Sealing Machine. Heating sealer with 4 sides of heating control, each sealing side temperature can be adjusted separately with good heat-balance to ensure the seal of good quality. 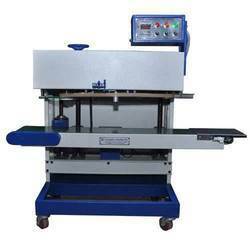 Also, this machine is used in various industries for performing cutting and sealing operations. Our valuable customers can avail this machine from us at the nominal price in a given time frame. Metering screw is drive by step motor, so that can get higher repeat precision. With rich experience and knowledge in this domain, we manufacture and supply an extensive range of Continuous Sealer. This is suitable for all kinds of plastic film in the sealed bag, which can be widely used in food, medicine, and daily cosmetics, native products, chemicals, electrical original, military, clothing, artifacts of their departments. This machine is used electronic temperature control and automatic transmission device can be controlled in various shapes with a plastic film, in various packaging lines, supporting the use of its length sealed unrestricted. 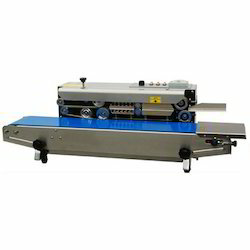 Looking for Pouch Sealing Machine ?